This component provides SharePoint users with two additional features for data entering. First, it allows users to create pre-defined masks for entering data of a specific type and, second, it allows to require selected fields of SharePoint lists to contain the unique values only. SharePoint Custom Mask & Unique Field component creates pre-defined masks for entering data of a specific type and allows to require selected fields of SharePoint lists to contain the unique values only. Available scopes: list, site, site collection. 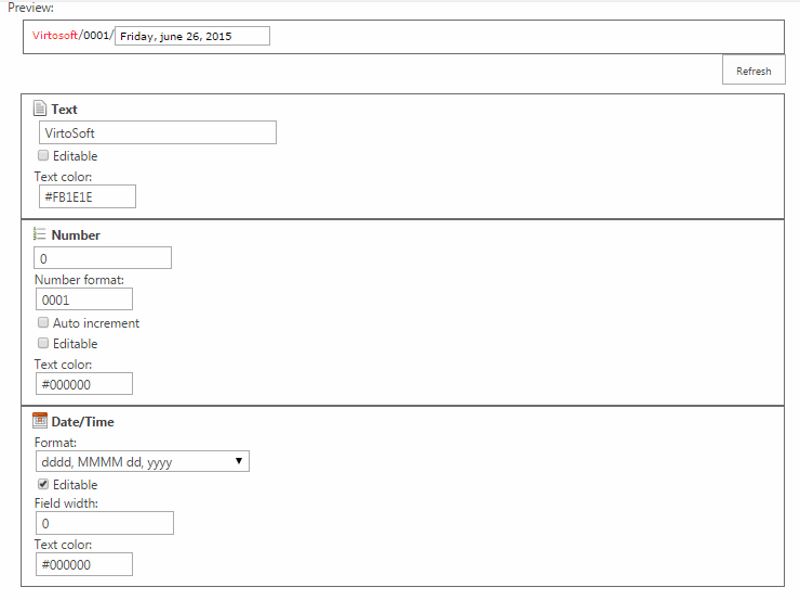 Available field formats: text, date/time, existing column value, site name, list name and number. SharePoint Custom Mask and Unique Field Validation allows any SharePoint list field to contain unique values. With a single click on a check-box, that will be available in the field options once the component is installed, a user can make colleagues’ or clients’ last names to be unique, preventing double entering the data in the corresponding list. This feature, which is not available in standard version of Microsoft SharePoint, allows users to create compact lists of data that contain relevant and needed information only. SharePoint Custom Mask and Unique Field allows you to use other additional convenient features such as auto increment function for number fields and color settings for fields of mask. Also, you can adjust a duplicate value message. SharePoint Custom Mask & Unique Field component provides SharePoint users with two additional features for data entering, and is fully compatible with Microsoft SharePoint 2016, 2013, and 2010. SharePoint Custom Mask & Unique Field allows users to create pre-defined masks for entering data of a specific type and, second, it allows to require selected fields of SharePoint lists to contain the unique values only. Number – Auto Incremented, Go beyond the single digit ID of 1, 10, 100 and set it to show the same number of digits, say 4, all the time: 0001, 0010, 0100. While flexibly combining these default templates, a user can easily obtain a custom mask that would ideally fit his requirements and provides the users with a tool for as quick and easy data entering as possible. Furthermore, SharePoint Custom Mask and Unique Field Validation enables to require any SharePoint list field to contain unique values. With a single click on a check-box, that ability will be available in the field options once the component is installed, and a user can make colleagues’ or clients’ last names to be unique, preventing double entering the data in a corresponding list. This feature is not available in a standard version of Microsoft SharePoint and it allows users to create compact lists of data that contain relevant and needed information only. Text display Capital, upper and lower mask text display are available. Select mask color With SharePoint Custom Mask & Unique Field, color can be set for fields of mask. Easy tool to create custom masks in SharePoint. I don't have any problems with this web part! Smart SharePoint component for creating predefined masks, it was useful as a specific solution.